Walking down the area known as “The Loop” one can find any number of interesting places to stop and take a break whether you are looking for food, alcohol, coffee or other items of satisfaction, “The Loop” is the place to be. Against the heat of this week, we wandered into this great little sandwich shop with the very funny name, Snarf’s. They are a small chain that originated in Denver, but since my travels have yet to take me there, I cannot comment on how the St. Louis restaurant compares. All I can say is this place makes me one happy dog. I know, I too find it a little odd to get so excited over a Cobb Salad and a Ham and Cheese Toasted Sandwich, but I’m telling you this place is fantastic! Their milk shakes and malts are out of this world good, and the service is friendly and laid back. The food is made to order so it takes a little time, but be patience, it’s worth the short wait. 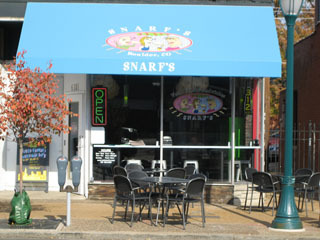 If you find yourself in Denver, or in St. Louis you have to check out Snarf’s!